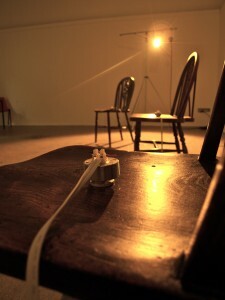 The Ghost Quartet installation was shown at Audiograft 2012 – Oxford. 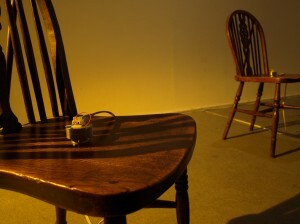 There was an empty space where four chairs, lit by a theatre light, seemed to emit sound. 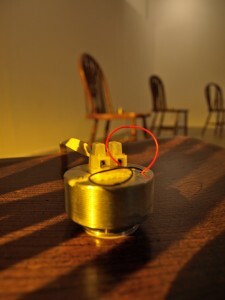 The idea was developed from a collaboration with sound artist Wajid Yaseen (http://www.youkneeform.com/background/) at a public work –in- progress event at the London gallery Soundfjord , where a lot of experimentation went on which included playing sounds into objects, buildings and people. Each chair in the quartet had a transducer attached to it. 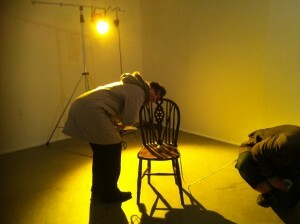 Sound was played through the transducer into the chair, and the chair then amplified the sound. The sound wave travelling through the wood amplified the sound wave according to the quality or density of the wood. The main oddness, mismatch or disjuncture of understanding in the scenario was that sound was coming not from either people or speakers but from the chairs themselves. 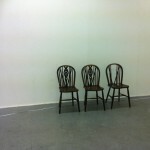 The sight of the empty chairs begged the question –if this was a quartet where were the players? We chose for the Ghost Quartet to have music and body sounds that we felt were associated with the look of the chairs as instruments and as chairs belonging in a waiting room . Wajid composed a string quartet and I recorded different internal body sounds. We were drawn to the associations of the look of waiting-room chairs, the medical look of the transducers, the subsequent anthropomorphising of the chairs (looking like they were having treatment), and the quality of the sound through the chairs as amplifiers. We hoped that this would suggest to the visitor that it was it wasn’t just a straightforward recording being played by musicians while you looked at their empty chairs. A theatre light focused on the chairs highlighted the grain of the wood to further highlight the material of the wood and the theatricality of possible narratives assumed by the onlookers. In the collaborative process with Wajid, we were interested in a range of different ideas, and that encouraged us both to try out more options than we would have if we had developed the work on our own. One element of this was the string quartet music, which I wouldn’t have thought to make, and I’m grateful as it has opened me up to ideas of music in this set of developing sound work. Putting this particular set of elements together has posed questions about odd associations: featuring an object and highlighting its beauty and it being a bog standard kitchen chair, the use of atmosphere with mixtures of unfamiliar body function sounds with calming music, the unfamiliar way the sounds are heard through he wood and why that might be interesting or familiar. It was fed back to us that it felt odd to bend down before the communal kitchen chairs listening into them, as if treating them almost reverently. Some people wondered what the relationship of the sounds and the music was, and others worked out where the sound was coming from gauging with their ears its unfamiliar route through the chairs. •	‘What a wonderful experience, I could have stayed here for hours- magic! •	‘Fascinating experience – chairs as loud speakers/transducers has got me thinking! 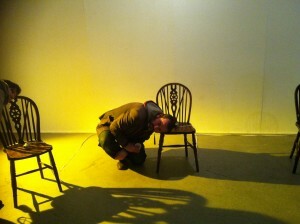 •	‘Placed at different positions on the chair, what sounds would be generated? •	‘Very interesting love the sound of the heartbeat sounds going through my body. 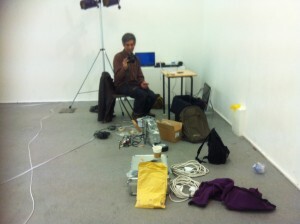 Setting up the sound – run from a Max Patch on a Mac Mini in the space. David Tudors’ 1968 Rainforest piece came up in conversation as an early work where he played and amplified sounds through objects. 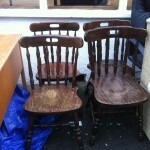 Auditioning chairs – these didn’t make it!